Transform the look of your living room with one coffee table set. The Cole 3 Piece Table Set combines elements of wood and glass to create a modern and chic design. If your living room needs some love, the Cole set might be exactly what you need. One easy way to make your living room feel connected without putting in a lot of effort is to purchase a coffee table set. At American Freight Furniture and Mattress, we have a wide selection of coffee tables with matching side tables to bring your theme full-circle. We love the Cole 3 Piece Table Set because it has an eye-catching design. Each table in the Cole set features a smooth glass table top with a mahogany brown trim. The center of each table has a jackdaw-style base and four vertical legs in the same dark brown wood. The coffee table has an oval shape and both side tables are circular. Did you know curved furniture is currently on-trend? Read more about the style here. Rustic Farmhouse—If you love the look of wood textures and metal accents, the Cole coffee table set is a great way to add a presence of a natural wood finish and a glass accent. The dark stain is warm and inviting to blend beautifully with your outdoor-inspired room. Industrial—If you have a minimalistic design with emphasis on exposed brick, metal pipes and ductwork, and other industrial elements, you’ll love the monochromatic color of the Cole table set. The dark brown will help you stay true to the industrial theme. The jackdaw-style base will add an unexpected flair to the area. Modern Traditional—If you have traditional furnishings in your living room, try the Cole for a complete coffee table set that won’t crowd your space. The glass table top detail will put emphasis on the design of the set. Best of all, light travels through the glass to make your room appear more spacious and less stuffy. No matter what theme you have going on in your living room, there’s a table set to meet your needs at American Freight Furniture and Mattress. Click here to find your local store. We also offer incredible payment plans. For more information about our no credit needed options, click here. Don’t limit your coffee table set to the living room. The Cole 3 Piece Table Set is an excellent addition for home theaters, basements, and offices, too. You can even consider splitting up the table set throughout your home. The side tables make great nightstands in guest rooms or hallway tables as well. Feel free to get creative with how you stage the tables. Are you subscribed to the blog? Well, you should be! 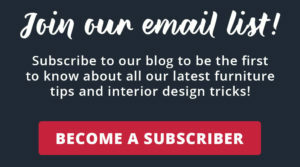 Simply add your name and email address to our sign up page and we’ll send you all the latest blogs directly to your inbox. Click the image below to get started.